1. Do you eat Oreos? YES! I love them. 2. If you eat Oreos, which are your favorite – original, double stuff, golden original, golden double stuff, Oreo brownies, Oreo ice cream? original, but I really enjoy the golden original also. We have the golden original ones at our house right now. 4. Are you able to pass by a plate of cookies and not take one or are you a bit of a 'Cookie Monster'? I LOVE cookies, I am definitely a cookie monster! I would for sure stop and grab a cookie. 5. Tell us about your favorite cookie. Crunchy, soft, chewy, crumbly, other? a bit of a mix of crunchy and soft...just a bit of crunch. 8. It is that time of year and they are selling them on every corner and in front of every store! Do you buy Girl Scout cookies and if you do, which is your favorite? I usually do buy Girl Scout cookies, but I did not this year. I like to try new ones, but Thin Mints cannot be beat. 9. Raw cookie dough. Yay or Nay? Yay, but I do not eat it anymore. I loved eating it when I was younger. 10. Do you like cookies with filling? yes. 15. Please tell us something random about your week!! We had parent teacher conferences last week, so Friday we had a short day...we had meetings and we were done at noon. Then my co-worker and I went out and had a really nice lunch at Spring Creek Tea Room...I had Ham & broccoli quiche, loaded potato soup and a hot roll. They are famous for their desserts, so I had a piece of coconut cake. It was so good! Then we went shopping for a little bit. I bought 4 tops for Spring. It was a good outing! I had a lot of fun. Happy St. Paddy's Day Lori. How can you not dunk cookies especially oreo's LOL!! I'm a dunker myself. Enjoyed your answers my friend. Mine will be online after midnight. Sweet dreams dear Lori. Sounds like a fun Friday after noon!! Have a great Sunday! Enjoyed my visit this morning.. YOu conjured up memories of my "younger" days. I guess I did eat cookie dough, but that eons ago! Enjoyed this post about Oreo cookies. 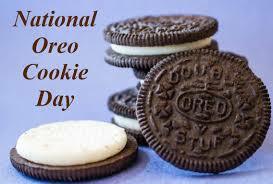 I am certainly a dunker when it comes to Oreo's. I love a good Oreo and milk. I prefer the original ones as well. Have a great St. Patrick's Day! Sounds like you had a wonderful outing! I think everyone loves Oreos. I am not a fan of parent conferences--I never see the parents I need to see! Lunch out and shopping with your friend... sounds great!! Even greater when you find some things you love! The cookie questions were very familiar... LOL. You aren’t a dunker 🤭 Cookies are a danger in my house. I’m okay until after dinner... Sounds like a perfect Friday! Sorry, my persona is still on blogspot! Cookies are one of the best little hand held foods to hit the big time. I don't eat raw eggs in anything anymore. I've had my scare. Never again. Your nice lunch out with a co-worker sounds so cool. I always liked lunch out rather than dinner. Have a lovely week, Lori. Quiche at the Spring Creek Tea Room ... I hope it was as delightful as it sounds. Your afternoon with your coworker sounds like it was wonderful! I'm glad you were able to get away for a girls' day and have so much fun. Happy St. Patrick's Day! You know, I don't think I've ever been to an actual tea room in America. I'm sure they exist. Probably not even far from me. Why don't I go to brunch more? Huh. Never thought about this. I know it's not really a guy thing to do, but still. Interesting. Thanks for the random. Your lunch last weeks sounds like it was quite yummy. What a fun outing.